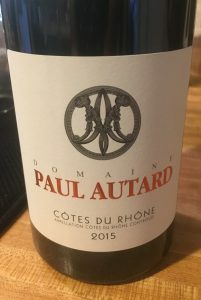 2015 Domaine Paul Autard, Cotes du Rhone, Rhone Red Wine, France. The Autard Cotes du Rhone Rouge is a baby Chateauneuf du Pape blend of 70% Grenache, 20% Syrah and 10% Mourvedre that really over delivers for the price with deep and spicy flavors! There’s a lot of lovely details and tasty layers of fruit, mineral tones, peppery notes and wonderful texture as well as perfect vintage characteristics, especially great in such a great year in the Rhone. This full bodied effort has deep layers, focus and lingering lushness, but with nice savory elements to keep things in balance! The ripe satiny tannins help in giving this Rhone it’s balance and lifting it’s open charms, the Paul Autard Cotes du Rhone shows brandied cherry, raspberry, plum and boysenberry fruits along with dried flowers, peppercorns, dusty/chalky stones, iron, anise and garrigue/lavender. While forward and sweet fruited, this Cotes du Rhone has old world harmony and style and is certainly a good bottle that will please any crowd as well as be really fun with any meal, be sure to serve at cellar temperature to make the flavors pop and taste refreshing. The Grenache is extremely expressive and juicy putting the Syrah and Mourvedre firmly in the back seat, though they add to the complexity overall and might show up at a later date, but that is not a fault and drinking this wine young is pleasure.